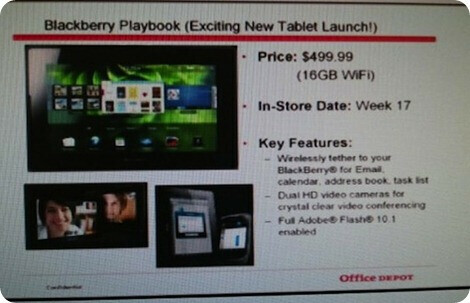 Office Depot will sell the BlackBerry PlayBook for $499.99? Coming out of left field today, we find yet some additional interesting pieces of information regarding the upcoming BlackBerry PlayBook. Sure there might be some Verizon customers being given the opportunity of test driving the highly prized tablet, but now there appears to be some light on its pricing. Today, a screenshot of Office Depot’s internal inventory system was leaked and provides some valuable details regarding the BlackBerry PlayBook. 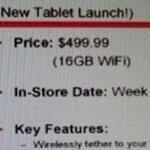 Looking into it, we find that the Wi-Fi only tablet is currently being given a $499.99 pricing. Additionally, the 16GB model is penned with a week 17 in-store date which places it sometime between the end of March and early April. Previously, it was rumored that the base model of the PlayBook would be priced around $500 – which makes this leak even more telling since it's within the boundaries. Even though its pricing has yet to be officially confirmed by RIM, does the sound of it being $500 good enough for you to warrant a purchase when it’s finally released? and we have a winner!? SOLD! Will be there opening day! Yep, good enough. Chalk up a sale. $500? Thats nice, if this price is real then i think many people would consider buyinh this. Especially for those who own BBs. There is supposedly an ability to connect to the Internet using the host BB's wireless data connection. The PlayBook may be more bad news for Motorola's Xoom. Especially if it ships before the Xoom.